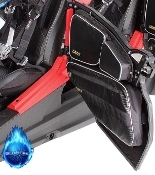 BlueFire's Bear Claw Doors fit RZR, RZR-S, XP, RZR 570, all years. Includes two doors and all installation hardware. Standard & custom graphic kits are also available.